Fascinating insights into both the science behind the Spitfire’s elliptical wing, and the man who designed it. While Reginald Mitchell is rightly hailed as the man who created the Spitfire, he did not design it on his own. One of Mitchell’s key achievements at Supermarine in the late 1920s and early 1930s was to assemble a team of experts who worked together well and who responded positively to his leadership. Amongst these was Beverley Shenstone, a Canadian aeronautical engineer who joined Supermarine in 1931 when he was 25 years old, and who was primarily responsible for the Spitfire’s signature elliptical wing. This book by Lance Cole is not quite a biography of Shenstone. It tells the story of Shenstone’s life, from his childhood and education in Canada to his post-war association with British European Airways, but its focus is on how the Spitfire – and particularly its wing – was designed in the mid-1930s. This analysis is the centerpiece of Cole’s work, and so it’s fair to say that the Spitfire shares equal billing with Shenstone as the story’s main character. The book opens strongly with a series of chapters that describe how Shenstone ended up at Supermarine in 1931. 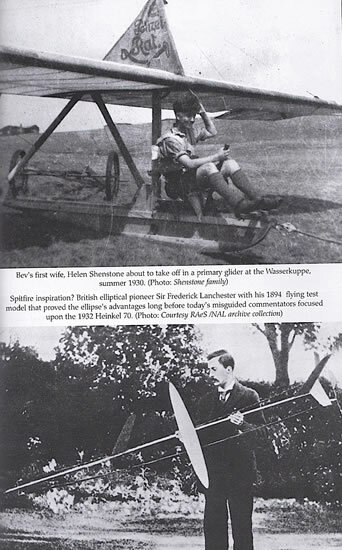 His journey was a fascinating one: after graduating as “Canada’s first Master in aeronautics”, Shenstone went to Germany where he worked for Junkers in 1929-30 and then Alexander Lippisch in 1930-31 (with whom he remained friends for over 40 years). These were formative experiences for Shenstone, and arguably one of the main reasons why Reginald Mitchell hired him. 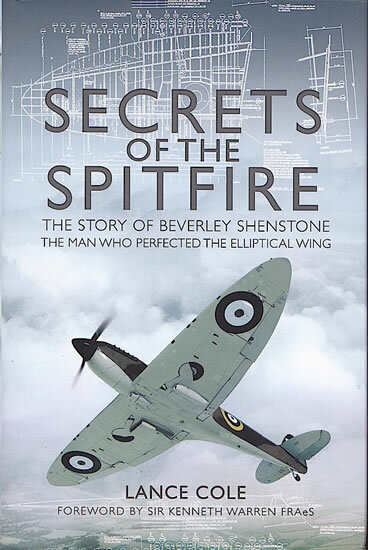 The next 130 pages are devoted to Shenstone’s time at Supermarine, and a detailed exposition of how he developed the Spitfire wing. Unfortunately, this is where the book flags a little. While the Spitfire was without doubt a remarkable aircraft design, Cole’s arguments in support of this are repetitious, and would have benefited from more rigorous editing. Soldiering through this section was nonetheless rewarding – Cole presents a myriad of facts, figures and anecdotes, including an interesting comparison of the aerodynamic efficiency of the Spitfire and Bf 109. The apparent similarity in the wing shapes of the Spitfire and He 70 is also discussed, with Cole dismissing as nonsense any idea that Shenstone was influenced by the German design. The text is well supported by 16 pages of black and white photographs. Some excellent images are included, such as Lippisch and his design team (including Shenstone) clustered around a desk in 1930, and Shenstone posing next to a Junkers Junior aircraft, also in 1930. 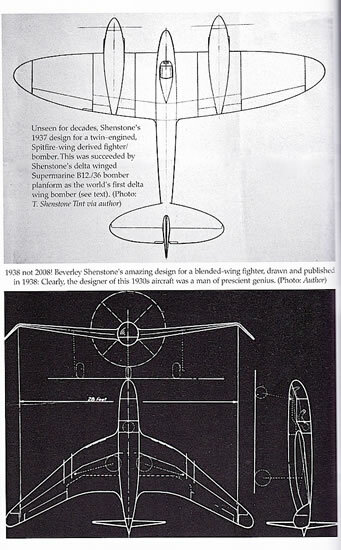 Shenstone’s 1937 design for “a twin-engined, Spitfire-wing derived/fighter bomber” is also reproduced – now there’s a scratch-building project! My criticism above notwithstanding, I found this a fascinating and highly informative book. 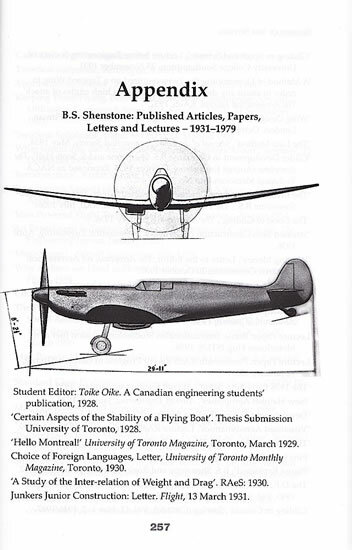 Cole has researched his subjects thoroughly, and leaves the reader in no doubt about the uniqueness and efficiency of the Spitfire’s wing, or of Shenstone’s role in creating it. Highly recommended to anyone who wants to understand more of the history and science behind Britain’s most famous aircraft. Thanks to Pen and Sword Aviation for the review sample.